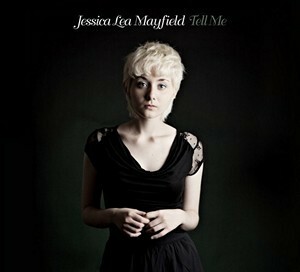 Jessica Lea Mayfield's Tell Me is a pensive, nearly mournful record that reminds me of shuffling slowly through the rain without paying mind to how soaked the situation becomes. Mayfield seems to revel in the drops of cold, soaking up the moment with beautifully simple lyrics and touches of nervousness. Mayfield's first release, With Blasphemy So Heartfelt, was released in September of 2008 and featured The Black Keys' Dan Auerbach as its producer. Later, Mayfield held the honour of being the first guest vocalist to appear on a record by The Black Keys when she supplied backing vocals to "Things Ain't Like They Used to Be." Tell Me, her third record, comes steeped in the sort of sadness that few traffic in. Auerbach is again on board as producer and Mayfield cries the blues through a haze of slow-burning guitar and deep organs. This is a record that revels in its own sinking feeling. It's brought to life by blistering guitar on the lead track "I'll Be The One That You Want Someday," but Mayfield's unadorned vocals drive it back to the dirt where it belongs. As sleek as the song sounds at the outset, it's still as gritty as a front porch after a sandstorm. Mayfield is more melodic than expected, however, and that shines through on the sharp "Our Hearts Our Wrong" quite nicely. Auerbach's fills are satisfying and the organ plays with the edges, but it's Mayfield's commitment to the theme that propels this one. The Ohio native is unafraid of exploration, as "Grown Man" proves. It's a bit of Nintendo reggae, fluttering with sound and a cool groove that breaks up the album's bleakness nicely. Mayfield's vocals don't float too high, however, as she sings "There's not much I wouldn't let you whisper in my ear." Tell Me is one of those records that simmers in dirt. It's not a classic, but it lends credence to the fact that there's an awful lot of clever beauty to be found in life's more desperate moments.